North Korea has launched another test missile. This time it was in reaction to South Korea electing a new President, Moon Jae-in. Kim Jong-un has tested missiles during the Japanese Prime Minister’s visit and days before the Chinese President’s visit to the United States. Moon is known as a moderate. He stated he is willing to visit Pyongyang and ease tensions between the two long-feuding nations. The United States’ Ambassador To the United Nations, Nikki Haley explains Kim and his country’s erratic behavior as “paranoia.” Haley also said that the United States would not negotiate with North Korea unless they stop testing missiles. The Japanese defence minister said it flew for about 30 minutes before falling in the Sea of Japan and could be a new type of missile. Tomomi Inada said it covered a distance of about 700km (435 miles), reaching an altitude of more than 2,000km (1,245 miles) – higher than that reached by an intermediate-range missile North Korea fired in February. Experts fear that North Korea is getting closer to an ICBM missile that can hold a nuclear warhead. A weapon like that could easily hit targets in the continental United States. 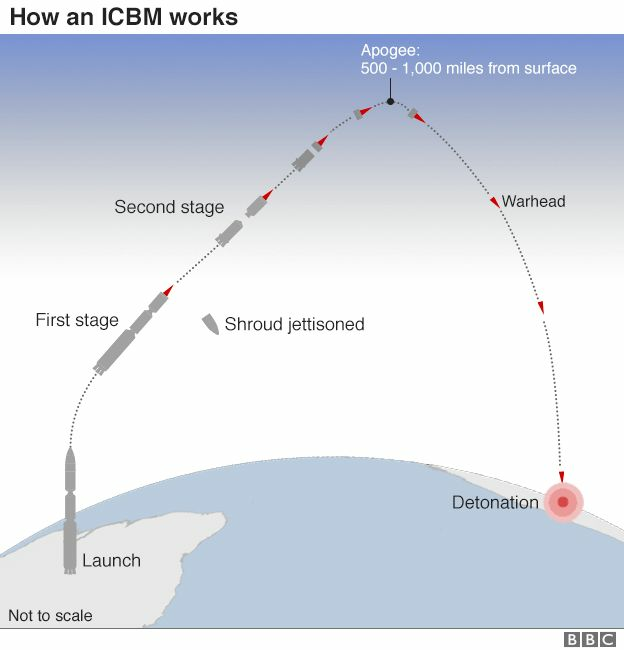 The United States recently sent the THAAD missile defense system to South Korea. The system will be up and be running by this summer. To counter missile attacks, the United States has a multi-faceted system to stop incoming missiles. Satellites, land and sea-based radar and several missile systems are designed to work in conjunction to eliminate a missile threat. Hopefully, it never comes to this. North Korea is still a long way away from a real functioning missile. North Korea only does this for attention. They do not want war and conflict. They need food and aid. Share your thoughts on North Korea in the comments below.